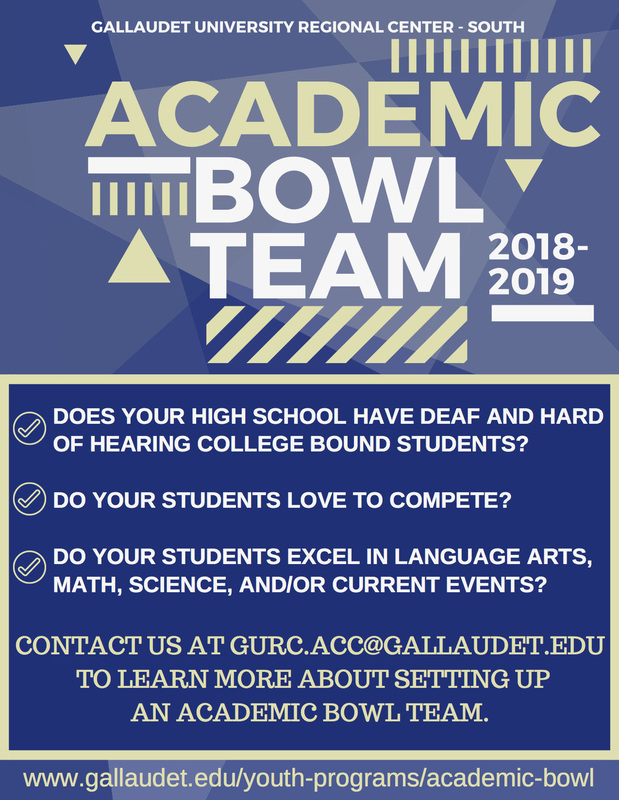 The Academic Bowl for Deaf and Hard of Hearing High School students was established with the goal of fostering the pursuit of academic excellence, promoting a spirit of academic competition and sportsmanship, and providing social opportunities for the development of collegiality and lifelong friendships. Every year, Gallaudet University hosts four Regional competitions for up to 80 teams of Deaf and Hard of Hearing high school students. 20 teams will then advance to the National competition held at Gallaudet every year. Coaches: Registration for the 2019 Academic Bowl will open on Wednesday, September 19, 2018. Please check back here as time nears. Be sure to sign up for our Coaches’ Corner! Scroll down to the bottom of the page to meet the Academic Bowl Executive Committee!